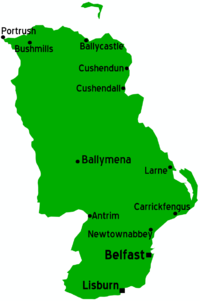 For other places with the same name, see Antrim (disambiguation). The Glens of Antrim offer isolated rugged landscapes, the Giant's Causeway is one of the most striking landscapes on Earth and is a UNESCO World Heritage site, Bushmills produces legendary whiskey, and Portrush is a popular seaside resort and night-life area. It is one of Northern Ireland's most fascinating counties. It is also home of the Ulster Grand Prix, set in the tiny village of Dundrod and is the world's fastest motorcycle racing circuit. Belfast International Airport is situated near the town of Antrim, and is convenient for exploring the region. Ferries from Scotland land at Larne. Translink  operates the public transport system in Antrim. Standard Northern Irish fare, but if you're lucky enough to catch the Oul Lammas Fair in Ballycastle (held on the last Monday and Tuesday of August), be sure to try Yallow Man, a rock hard yellow sweet that is eaten with the aid of a hammer. Make sure your dental insurance is up to date first. Bushmills Distillery, of course. You can take distillery tours, and you'll likely be more merry going out than when you went in. It's worth noting that at the end of each tour four people from the tour group (two women and two men) are asked to volunteer for a special whiskey tasting, where participants get to try nine different types of whiskey. US visitors who are unaccustomed to driving on the left are well advised to shun the whiskey tasting. Buy some to take back to your hotel. Stay sensible, don't wander around urban areas at night or make political statements in strange company, and you'll be just fine. This page was last edited on 29 July 2015, at 20:22.